Ricardo* asks for a minute to set his ideas straight. Through Skype, his voice sounds hurt but steady. He’s been in exile in San José de Costa Rica for 15 days, since the Nicaraguan paramilitary branded him as one of the “traitors” against the revolution of Daniel Ortega’s government. He’s 22 and a Law student in the American University of Managua (UAM). “I was in the streets since April, supporting my classmates and aiding the wounded [from the protests ]. One night I was at home resting, and I got a phone call. A voice told me that if I didn’t keep to myself, they’d kill us all.” Ricardo fled to Costa Rica at his mother’s insistence. He took his 15-year-old brother with him and they’re both living with an uncle who’s been living among the ticos for 20 years. A voice told me that if I didn’t keep to myself, they’d kill us all. This case is just one of the many Nicaraguans who have fled to Costa Rica in the last 100 days. This week, the United Nations High Commissioner for Refugees (UNHCR) asked the Costa Rican government to support all the people who crossed its borders fleeing the Nicaraguan crisis. In the last month, Costa Rica has received 200 political asylum requests from Nicaraguans, and it’s carrying out 8,000 such proceedings since April. UNHCR estimates that between 100,000 and 150,000 Nicaraguan families live in Costa Rica, who have offered support for these new exiles. UNHCR has also requested that all countries hosting Nicaraguan citizens offer the necessary cooperation to ease their transition and legalization. Although Costa Rica is the country with the highest trend of Nicaraguan requests in the first half of 2018, with a significant spike in June —according to UNHCR spokesman William Spinder— and Honduras, El Salvador and Guatemala are also becoming transit countries. Spinder said that they’re closely monitoring the situation of more than 700 refugees and asylum applicants, mostly from El Salvador and Honduras, who live in Managua and other cities of Nicaragua. UNHCR estimates that between 100,000 and 150,000 Nicaraguan families live in Costa Rica, who have offered support for these new exiles. Yes, Ortega thinks that digital tools have been the triggers of violence and that many of his countrymen “have been led astray” by terrorists practices that were previously unknown in the country. 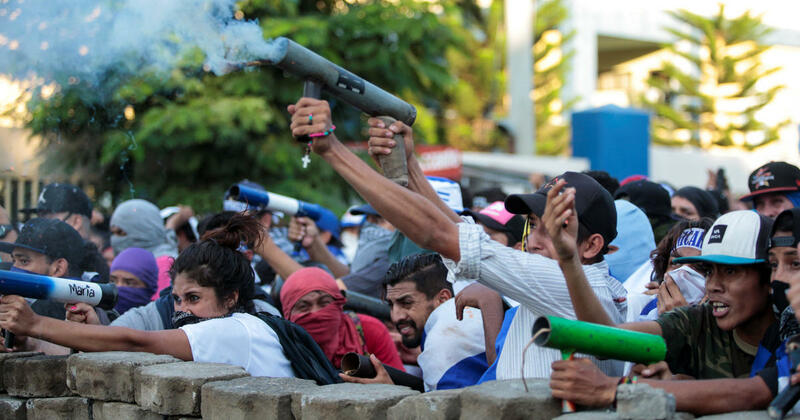 There are countless of videos and pictures of protests in recent days: young citizens shot in the head, gangs of hooded thugs lynching people and barricades destroyed by explosions are only a small part of what has been Nicaragua’s season of terror. “Terrible. It wasn’t just one case, there are many cases of Nicaraguan brothers burned, in flames, among them two police officers. Terrorism, there’s no other word,” Ortega says that it’s terrorism financed by the United States, the United Nations and the Organization of American States. What he not-so-elegantly forgets, is that the Inter American Commission on Human Rights and the Civic Alliance (a Nicaraguan opposition organization) have created two reports, with data collected in the field of protests and testimonies of the people affected, indicating that 80% of cases of people wounded or killed in Managua have involved paramilitary groups. It’s common to see improvised checkpoints set by these groups all over the city to intimidate citizens and assault protesters. “We (the Sandinista Front of National Liberation) never applied these tactics in our fight against Somoza. These practices have been imported into our country,” Ortega claimed before Air Force members. “Ortega doesn’t care about lying, he’s a master when it comes to lies; he and his followers, those who have specialized in torturing and murdering dissidents. They’re the ones who choose repression over dialogue. There’s no foreign interference of any kind in these cases,” says Ricardo, who got a bullet wound in a leg during a clash in downtown Managua. That day, paramilitary forces arrived and fired in cold blood upon students armed only with stones and molotov bombs. Ortega doesn’t care about lying, he’s a master when it comes to lies. In view of “interference” accusations, the OAS responded through Secretary General Luis Almagro, who said that the government’s liabilities for this crisis “can’t be transferred” out of convenience. Almagro proposed the creation of a special committee within the organization to promote dialogue between the parties involved in the crisis. A dialogue that Ortega doesn’t accept, and which is sidelined by the human rights violations committed in Nicaragua. In this situation, Nicaraguans will keep fleeing from the terror that’s spread through their country.